Polygenic. Schizophrenia is a complex neurodevelopmental disorder that is assumed to be caused by a mixture of genetic and non-genetic factors. The genetic component in schizophrenia is thought to be polygenic, i.e. due to the interaction of multiple genetic factors. Rare variants may play a particular role in this presumable polygenic genetic architecture, but so far this component of the genetic morbidity has been hard to pin down. Now, a recent study in Nature explores the role of rare, disruptive mutations in schizophrenia using large-scale population-based exome sequencing. Let’s find out about a new level of exome-wide honesty and why even a gene with 10 disruptive mutations in cases and none in controls is only mentioned in passing. The genetic architecture of schizophrenia. You need to have a lot of staying power if you are interested in the genetic architecture of schizophrenia. Be it CNVs, GWAS, or de novo mutation, it takes large to very large samples to identify a relevant contribution. In addition, as in the case of de novo mutations that we discussed recently, you might end up with a negative statement in the end, even though prior, smaller studies were quite encouraging. What was left to do in the genetics of schizophrenia was a large, sufficiently powered study to assess the role of rare, mostly inherited variants. The genetic contribution of these variants has not been assessed so far, and it was clear from the beginning that sample sizes in the thousands would be necessary. The recent study by Purcell and collaborators now presents a first milestone on the way. Their study provides us with a long-need benchmark on how such studies may be performed and what rare variant association studies can achieve. In a nutshell. In the various analyses performed by the authors, rare disruptive variants were defined as variants with a minimal allele frequency of less than 0.5%, 0.1%, or as singleton variants that had not been reported before. Also, the “disruptiveness” of these variants was analyzed in different ways, including only frameshift, truncation, and splice variants or adding variants that were considered pathogenic by prediction programs. To sum the publication of Purcell and collaborators up in a single sentence: when comparing rare disruptive variants from exome data in ~2500 patients with schizophrenia and ~2500 controls, there is neither significant enrichment for individual genes nor is there an overall enrichment for rare variants in patients. This negative statement, however, is only the beginning of the publication by Purcell and collaborators. Study by Purcell and collaborators. 2500 cases and 2500 controls were exome-sequenced and analyzed for rare, disruptive variants. The authors find neither an exome-wide enrichment nor a significant enrichment of single genes. However, when focusing on schizophrenia-related gene set, they find a significant enrichment. Even the most comprehensive gene set only provides excess of 0.07 variants per case, i.e. on average an excess variant in 1:15 patient with schizophrenia. Single genes. The authors were very conservative with regards to multiple testing. This resulted in the fact that even genes like KYNU coding for kynureninase, which had 10 disruptive mutations in cases and none in controls, was not significant. At first glance, this might be paradoxical: a gene with disruptive variants in 0.4% of cases that are completely absent in controls and other databases is not meaningful? However, when considering the amount of data that the authors compared, this statement makes sense: there is no way to tell whether this constellation might have arisen by chance given the number of genes tested. While KYNU remains a promising candidate, it needs further validation. 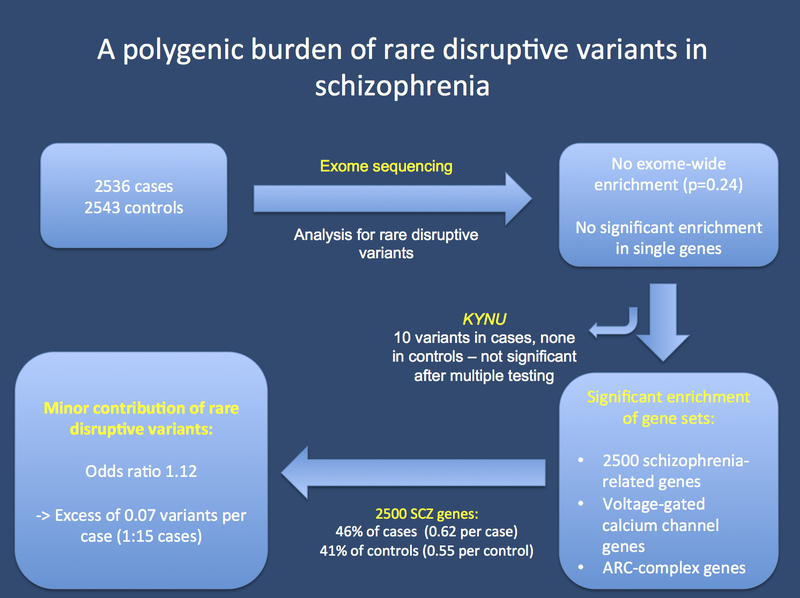 With regards to the burden of rare variants, patterns start to emerge once the authors focus on particular gene sets previously implicated in schizophrenia. Gene sets. The authors acknowledge that there is no enrichment of rare, disruptive variants when looking at the entire exome – and this is actually a good thing. If there was some exome-wide enrichment, this might possibly point towards technical artifacts or population differences between cases and controls. As the next step, the authors focus on particular gene sets including a set of ~2500 genes derived from CNV, GWAS, and de novo studies. In fact, they find a significant enrichment in this set of genes and several subset of genes derived from this, most notably a group of genes for voltage-gated calcium channels and genes for proteins implicated in the postsynapse, the so-called activity-regulated cytoskeleton-associated scaffold protein (ARC) complex. For both these subsets, ~1% of patients carried mutations in the respective genes while no variants were observed in controls. These findings will be highly relevant for future studies that might particularly assess variants in these genes in larger samples. A polygenic trickle. If there were one thing that I could change about this article, it would be the title “A polygenic burden of rare disruptive mutations in schizophrenia”. Burden – at least to me as a non-native speaker – implies a heavy load and somehow suggests that the role of rare, disruptive mutations is overwhelming. However, this is not the case. For example, when looking at the rare disruptive mutations in ~2500 candidate genes, the authors find 1547 mutations in cases versus 1383 in controls; the case and control cohorts were roughly the same size. This suggests an excess of 164 mutation in 2500 cases. Even if each and every one of these mutations were highly penetrant and causative, these variants would, on average, only be present in 1:15 patients and explain 6% of cases. The authors fully acknowledge this and compare the role of CNVs, common variants identified by GWAS, and rare disruptive variants. They conclude that GWAS variants explain an order-of-magnitude more heritability than rare variants and CNVs, a conclusion that nobody would have expected given the enthusiasm surrounding rare variants and large-scale exome sequencing. Lessons learned. As long as not proven otherwise, I believe that the genetic architecture of schizophrenia is a good model for the genetic architecture of common epilepsies including IGE/GGE and Temporal Lobe Epilepsy. The publication by Purcell and collaborators suggests that only prior knowledge regarding sets of candidate genes has the power to extract meaningful information from a cohort of ~2500 cases and ~2500 controls, a lesson that we should keep in mind for future studies in human seizure disorders. This entry was posted in 2014, Papers and tagged ARC complex, association study, CACNA1C, disruptive mutations, exome sequencing, KYNU, MAGUK, NMDA receptor, population-based study, PSD-95, rare variants, schizophrenia, SYNGAP1, voltage-gated calcium channel. Bookmark the permalink.